Writing in a foreign language is a difficult task. It is interconnected with reading. The more we read, the better we are going to be in writing. I believe, we should write more than what we read. Our language improves if we practice the knack of writing every day. It is not easy to translate one's thoughts into writing. It requires academic and linguistic competence to express one's thoughts in a foreign language. English is our foreign language. In our country, the quality of English writing, many would agree with me, has failed to reach a required standard. We hold plenty of workshops but don't get into the basics where the problems are coherently lying. English in our primary and secondary education systems is a shambles. There is a lot to learn from the English for Today book. It has proses, poems, anecdotes and some other features. If students go through that book, their cognitive learning is bound to improve. Many students do not even leaf through the pages of that book. Plenty of teachers, sadly but truly, are not qualified enough to make students read and encourage them to write and think. Many students do not get sufficient encouragement from their family members to read and write. We are making common mistakes. There is not enough proof-reading. Even in our English dailies, there is not enough editing going on. Because of learning wrong English syntax and semantics in many substandard English books, our students fail to differentiate between right and wrong expressions. We should make internet more accessible especially in remote areas. Our state should encourage students to google and update themselves with reading from any source available internationally. We should have more libraries. Our government and private sectors should work together for providing us with better libraries. A knowledgeable nation is always healthy. I was reared up in the best academic environment. I am a son of teachers. Reading and writing should have come naturally to me. Unfortunately, I was not at all interested in reading from an early age. The outside world gave me more pleasure. I found more satisfaction in frolicking around and playing cricket with friends. Till I was in my first year at the tertiary level, I only read a very handful number of books. Therefore, I think, it is important to inculcate in children the importance of reading books. We should inspire our children to develop the habit of reading books and expressing their thoughts in writing from their formative years. We should give them both Bangla and English books, simultaneously. Although I was not a well-versed reader, I had the knack of writing. I wrote my first Bangla rhyme at the age of 6. My poem was published in one children's magazine. Another piece of work was also published there right after then. I sent them another one but it was not published. I asked the editor (who happens to be my relative; now no more living in the world) why my write-up was not published? She gave me a blatant reply. She just said that my hand was not good enough. She had the right to reject my poem but she could have answered in a different way. My 6 year old ego was tremendously hurt. It knocked me down mentally. I lost my confidence to write anything either in English or Bangla for many years. There is a writer in each of us. We should not make any disparaging remarks to would-be writers. If we don't like another person's write-up, we can either ignore it or share our contentious issues euphemistically. We don't have any dearth of talented writers. Many don’t know how to appreciate others. Much to our dismay, many creative people fall by the wayside--- the lack of appreciation is one of the reasons. The platform for writers’ creative space has shrunk in the world of fanaticism and bigotry. Beside my father, I am grateful to my first genuine English teacher Parveen Sultana madam for making English interesting to read and write. She never emphasised the need to learn grammar. In her coaching center, she wanted us to focus more on our freedom of expression. She would check our write-ups meticulously. Madam is still alive. I still feel nervous of writing anything to her in English. Without her guidance, I would not have gone anywhere. At East West University, Bangladesh, I got late Iffat Sharmeen madam; Farhana Farid madam; Hasan Al Zayed sir; Zohur sir; Shafikur Rahman sir and Dr. Prof. Fakrul Alam sir whose meticulous ways of script-checking were second to none. They gave me feedback and encouraged me to develop. I am extremely grateful to them. A writer needs some guides and guidances. Learning is guru-based. I have one in Dr. Prof. Rezaul Huq whose encouragement gives me new hopes to develop more. Prof. Quazi Mostain Billah, Dean, School of Liberal Arts & Social Sciences, Department of English, Chittagong Independent English, is also of great help. I follow his suggestions religiously. Others will always try to put writers down. 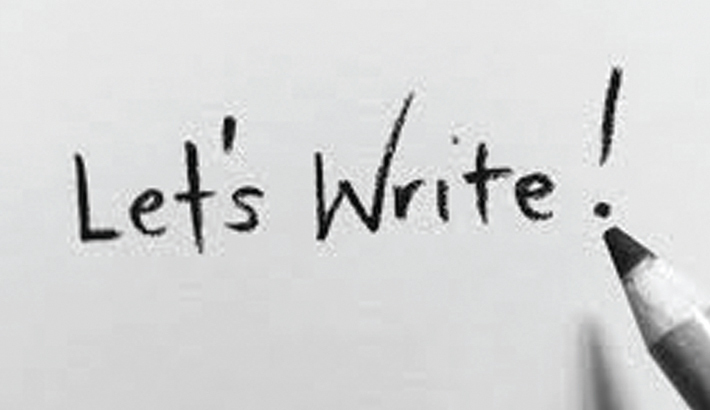 We should not allow others to decide how we should write. We should listen to our hearts. Believe it or not, people become jealous when they find others' write-ups getting published in newspapers. Writers should not think much about them. They just need to write for the pleasure of writing. There is no end to learning. We should read to learn and writes to unlearn. Shakespeare shows that authors are very sensitive towards criticism. No parent, I believe, likes hearing others' criticism about their children. Our write-ups are like our infant children. Through Puck's soliloquy, Shakespeare on hindsight, seeks apologies from his critics for making mistakes. He pledges to improve the quality of his writing. But he does not want his audience to tarnish the plot of the whole play. He does not want them to dent his confidence. Bangladeshi English writers need to produce more creative works, without compromising on quality. Our editorial panels should correct errors better. Teachers should check scripts more thoroughly. Unfortunately, in our country, we don't check scripts and give a thorough feedback. We have come to this profession not for money. Many teachers, unfortunately, are more interested in earning money than disseminating knowledge. Readers and writers, as Puck says, should be friends; willing to stay beside each other in happy times and sad times!